The Hunter's Star quilt top is now completed. I added the borders and corner blocks yesterday. I'm pretty happy with how it turned out. 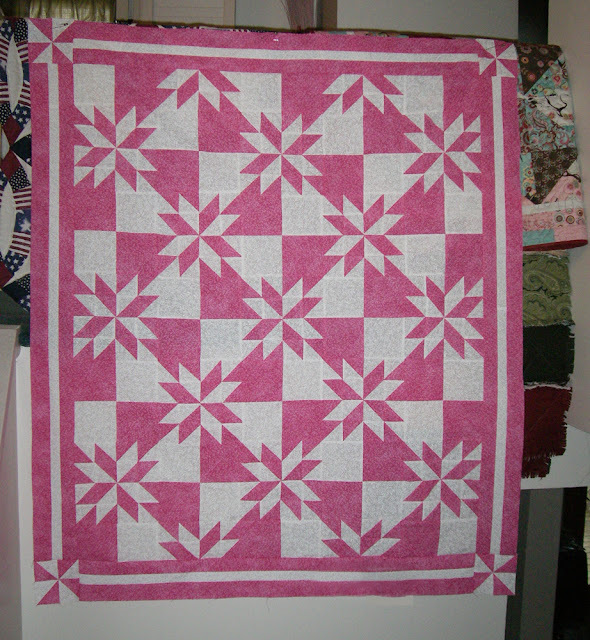 Especially since this was created completely with the pink scraps that were cut off of the backing to the Breast Cancer Quilts. I used all the scraps cut from the two quilt backing sides. I ran them through the AccuQuilt Go and created all the blocks necessary to create the pink portions of the quilt. The white was from my stash. I used a different white on white in the border. You can't really tell. Next step is to decide on how I want to quilt the top. I'm leaning more towards stitch in the ditch. My other option is an all over design. For now, it's hanging in my entryway and I'll keep looking at it to decide how to finish it. That is a stunning quilt. I love the way it turned out. Makes me want to do an Accuquilt Hunter's Star too. Wow that is gorgeous, well done! !